Provide protection when handling thorny stems, chicken wire, or sharp tools. Leather or suede is preferable. Include floral wire, twine, and small rubber bands, which are used for bundling stems or attaching them to stakes. Can be floral tape or household cellophane tape. Use it to create a grid across the opening of a container to support stems. Anchor stems in containers too shallow or wide to give support. Made from metal, glass, ceramic, and other materials. Water-absorbent anchor for stems and stakes. For clipping tougher, woody growth. Any paring knife, penknife, or utility blade sharp enough to cut stems cleanly (dull blades crush plant fibers, impeding water uptake); also useful for trimming and carving floral foam. Trims stems, excess foliage, and spent blooms. Removes thorns and leaves on stems. Wooden skewers with pointed ends (for anchoring in floral foam) and wires (for attaching fruits, berries, pinecones, and ornaments). Also used as short stakes for weak stems. Plastic water vials that keep flowers fresh; bases taper for easy insertion into floral foam or gaps in baskets. Can be shaped into floral-frog-like structures for use in large or irregularly shaped containers. 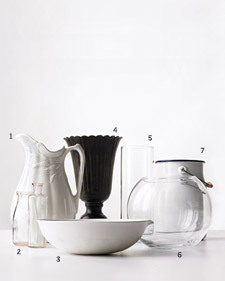 An opaque pitcher (or a ginger jar or even a well-rounded teapot) keeps stems hidden while offering a pretty profile. The narrow elongated neck provides ideal support for a "solo" arrangement: a single fern frond, lily, or tulip. One bottle can be exquisitely minimalist. Several bottles, however, work well together, grouped by color and shape or casually mismatched. Flowers dominate the scene when they stand (with the aid of a frog or floral foam) in a low, widemouthed receptacle. Sometimes a baking pan does the trick; but if the container will be visible, use a pretty bowl, tureen, or serving dish. This is a classic, whether it takes the form of a bud vase or a parfait glass. Some versions have a trumpet-shaped neck atop a wider body that curves in at the shoulders, like an ancient Greek amphora, providing stem support and an ample water supply. Long-stemmed, heavy-headed flowers such as sunflowers and gladioli couldn't ask for a better partner. A tall, straight vessel (be it a laboratory-glass tube or a bamboo pipe) also highlights the squiggles and zigzags of branches and vines. A globe-shaped vessel is good for domed masses of densely petaled flowers (say, chrysanthemums or dahlias) and clusters of mop-headed blooms (hydrangeas, peonies). An inexpensive fishbowl can do the job. A bucketlike container is the natural choice for bunches of cut garden flowers. The cottagey effect "relaxes" roses, delphiniums, and other blooms often used in more formal arrangements.